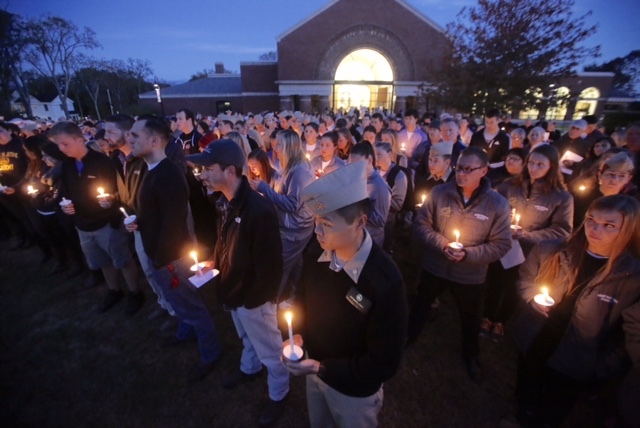 Students, faculty, administrators and alumni of the school hold a somber vigil for four Maine Maritime graduates who are missing at sea. 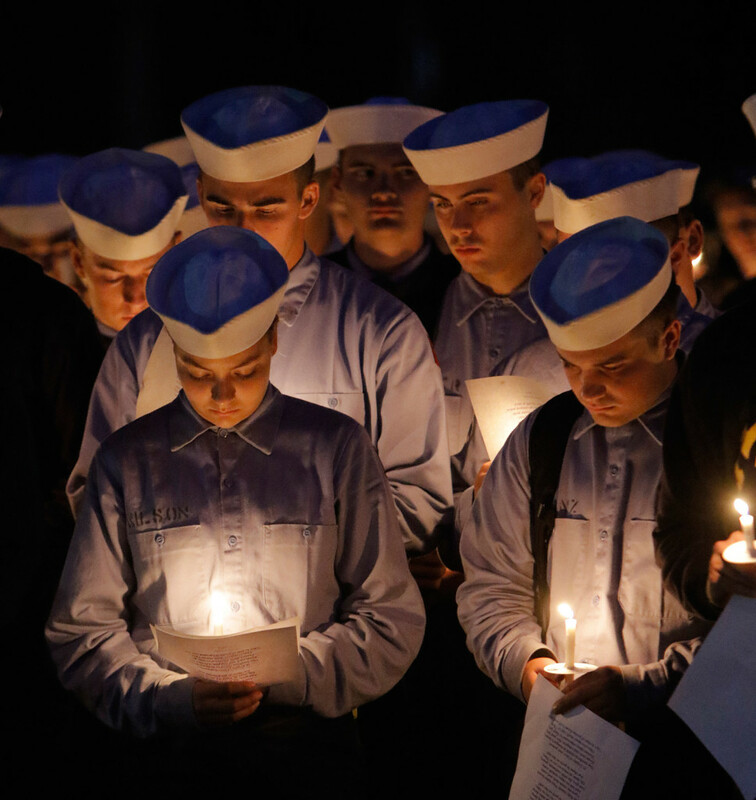 CASTINE — Hundreds of Maine Maritime Academy students were among those who gathered Tuesday evening at the campus for a candlelight vigil to express their hopes for the survival of four MMA graduates who are missing at sea. All four were aboard the cargo ship El Faro when it sank after being overtaken at sea by Hurricane Joaquin. Efforts continued Tuesday to search for the 32 members of its 33-person crew who remain missing, even as the chances of their survival continued to diminish. Searchers spotted the body of an unidentified crew member in a survival suit Sunday evening. 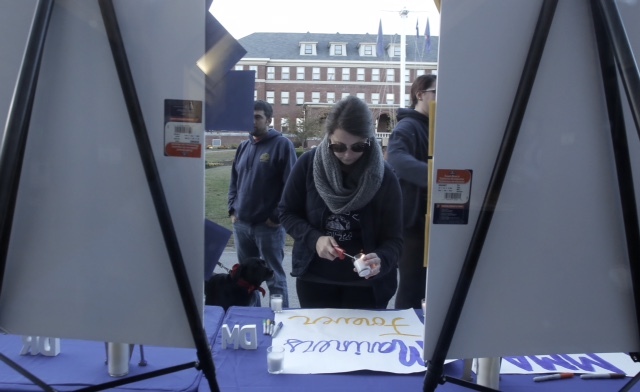 The somber vigil included prayers, songs, and heartfelt statements by students, faculty and administrators. “Look upward, and keep hope in your hearts,” MMA President William J. Brennan told the students, many of whom had broken down in tears. A table was set up with photos of the four graduates and handwritten signs saying “MMA Strong” and “Mariners Forever.” Some gathered around it to share stories of their experiences with the lost crew members or console those who were struggling to cope with the burgeoning tragedy. Academy graduates aboard the El Faro included the ship’s captain, Michael Davidson, 53, along with crew members Dylan Meklin, 23, Danielle Randolph, 34, and Michael Holland, 25. All four are from Maine. Many students said they knew Meklin, who graduated in May. Hilton described Meklin as a skilled and resourceful mariner, saying that she was still “100 percent hopeful” that he would be found alive. “Knowing him, he could make it for sure,” she said. Seniors Dina Bahloul and Alexi Galley cried as they described their friendship with Meklin. Although they said they were trying to remain optimistic, they also spoke of the need to be there in support of the loved ones of those crew members who may be lost forever. “They’re doing all they can, and they’re holding out hope,” Galley said. 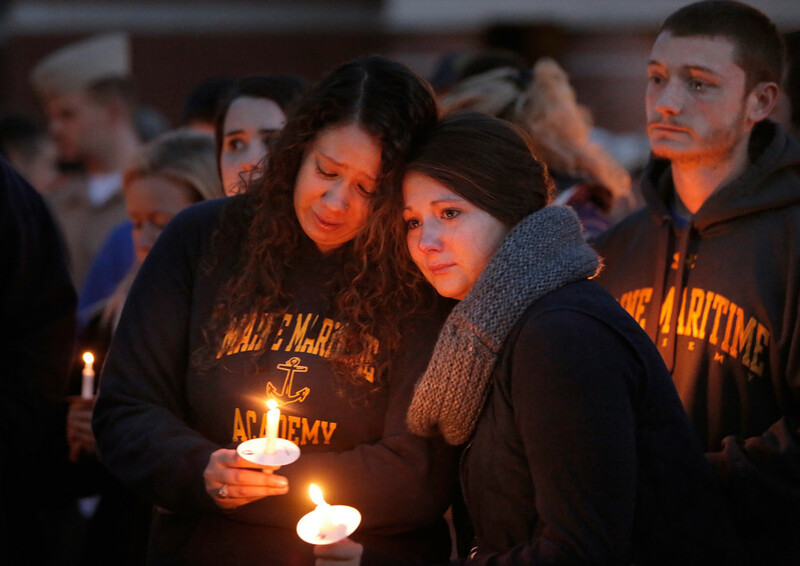 Alumnus David Gelinas attended the vigil and said current and former students at the academy share a special bond. “All of the Maine Maritime grads throughout the country are feeling tremendous anguish toward this,” said Gelinas, a Penobscot resident who graduated in 1984. Like the others, Gelinas said it was important to maintain a degree of optimism and allow the Coast Guard search-and-rescue crews to do their job. 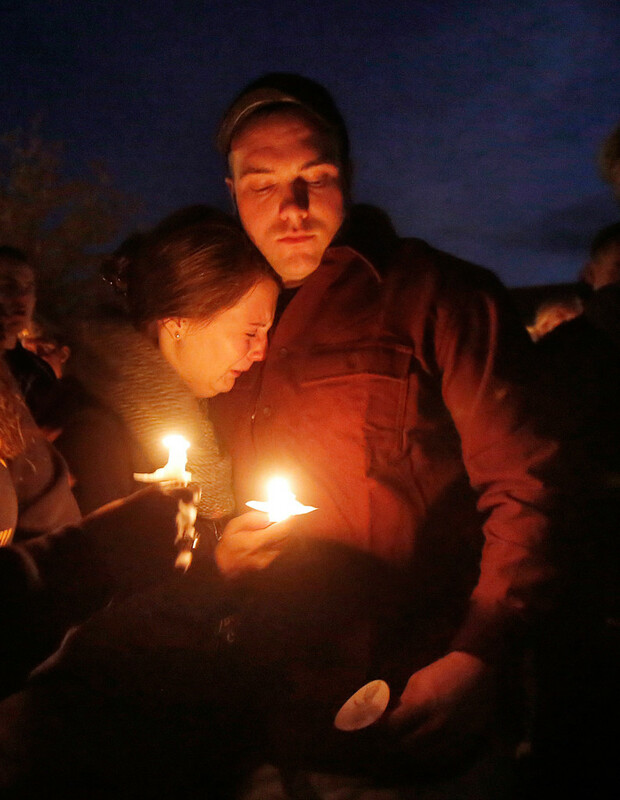 In the meantime, he said, Tuesday night’s vigil was a way for friends and classmates of the lost crew members to come together in support of each other. “I have to believe that it’s helpful at a time like this to be with others,” he said.